These 2:1 wire binding elements are designed for machines that use the 2 holes per inch punch pattern. 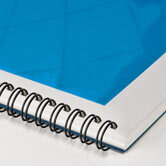 The elements are made from heavier wire to allow use with thicker documents. All wire elements have 21 loops to fit an 11" binding edge. Wire elements may be cut to fit a shorter edge.